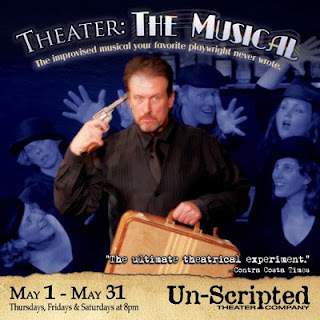 Experiment Farm: Theater: The Musical! I haven’t done much to overtly plug the show that I’m in on this blog, but Thursday night is your last chance to see me perform in the show. The show is Theater: The Musical. We get a suggestion from the audience for a playwright from the last 100 years or so (no Sophocles, Euripides, Shakespeare, or Johnson) who never wrote a musical (no Brecht or Sondheim) and then improvise a 2 hour show as if that playwright had written a musical. We have no preplanned characters, story lines, or songs. The less we preplan, the easier it is. So far we’ve done David Mamet (x2), Eugene O’Neil, Neil Simon (x2), Tennessee Williams (x2), Steve Martin, and Woody Allen. The O’Neil show was dark and depressing. The Neil Simon shows were light and hysterical. We let the audience choose the playwright, so you’re in control of what you get. You can read all about my experiences rehearsing and performing the show at my improv blog. Or, you can come see me Thursday night!